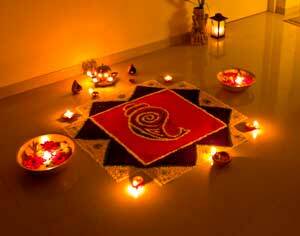 Bhai Duj (Bhai Dooj) falls on the last day of Diwali (festival of lights) which is the Hindu month of Kartika. Sisters show their love and respect to their brothers through prayer and gifts. Sisters put on a vermilion mark (tilak) on their brother's forehead and perform an 'aarti' as a mark of love and protection from evil. Brothers then give lavish gifts to their sisters. The restricted holiday allows government and businesses to remain open. Legend tell of Lord Krishna going to his sister after slaying the demon, Narakasura. His sister welcomes him with flowers, sweets, and a holy lamp. She marks a holy spot on brother's forehead for protection.